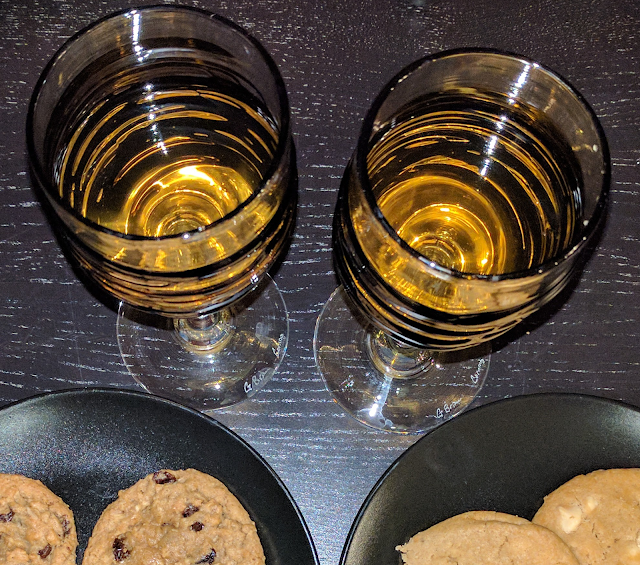 Preamble: I know I haven’t posted here in a while, so I thought I’d revive this as a good place to keep my booze records. 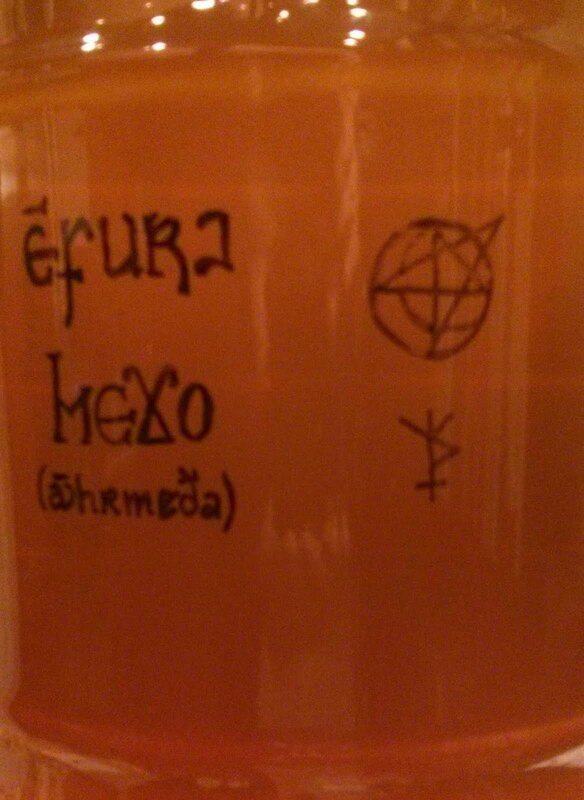 Below is the process (and eventual outcome) of a maple mead I’m brewing. I’ll keep adding to this entry gradually until it’s complete, so if you’re waiting to see how it turns out, you’ll just have to keep checking back! 1. Make Starter: Boil 2 cups of water with 2 tbsp maple syrup. Pour into a sterile container and cool to 100°F. Add yeast and leave to proof for 12 – 24 hours. 2. Boil Wort: In a large pot, bring 1 gallon of distilled water (minus whatever went into the starter) to a boil. Gradually stir in 6 quarts of premium light amber maple syrup and boil for 15 minutes. Pour into primary fermenter with two more gallons of (cold) distilled water and cool to 85°F. 3. Ferment: Once the wort has cooled, take your first hydrometer reading, then add starter and stir vigorously. Seal with air lock. Stir twice daily for one week, then once daily for another week. 4. Rack: At the beginning of week 3, rack the mead. Take a hydrometer reading. Add one more quart of syrup and enough water to bring the level up to 5 gallons (probably about 2 quarts). (Boil it if you want – I didn’t bother because the syrup and the water are both sealed, but if you do, make sure to cool it to at least 85° before adding to the must.) Take another hydrometer reading. Calculate the difference between the two readings to determine the current ABV*. Keep stirring every other day for another two weeks. Calculate: To calculate the δ between gravities, first calculate the ABV of the must at its present volume and determine the exact volume of the alcohol. Seriously, write it down, because you will forget it. The second reading will tell you the potential alcohol in the must after you’ve changed the volume, but the ABV will be incorrect. Figure out the percentage of alcohol in the new volume and work backwards. In other words, multiply the volume by the percentage of alcohol to get the volume of alcohol. Then, once you’ve added water (and/or syrup), take another reading. Divide the original volume of alcohol by the new total volume to get your new percentage, which you’ll add to any further readings. For example, take my first topping off: SG was 1042 (8%), and the volume was 4.25 gallons. 4.25 x .08 = 0.34 gallons of alcohol. Then I added a quart of syrup and two quarts of water, bringing the total volume to 5 gallons and the SG to 1054. 0.34 gallons divided by 5 = 0.068, or 6.8% alcohol. Rack: At the beginning of week 5, rack the must into a 6-gallon glass carboy. Again, take a hydrometer reading before and after. Rack: Once a month for another 4 months. Be sure to take before and after readings with each racking. If fermentation has ceased after 6 months, bottle. If it’s still bubbling, keep racking until it stops. 5. Bottle: Once fermentation has ceased, rack one last time into a bottling bucket. Take a hydrometer reading and calculate your final ABV. 5 gallons should give you about 25 750mL bottles. Cork and seal. If you end up with a half bottle… drink it! 6. Age: Age bottles in a cool dark place for 1-2 years before opening. (Maybe test one every 6 months or so.) Ideally it will be ready for Imbolc on the second year. 2015.08.02 – Moon disseminating in Pisces. OG: 1103. The starter and wort went off without a hitch. I left it to cool overnight since I don’t have a fancy wort chiller, and cast the yeast (added the starter) the next morning with the yeast nutrient. That’s when I discovered that I had given away all of my airlocks when I moved from Minnesota. Fortunately, though, I’m crafty in a pinch, and I managed to construct one out of some air hose, part of a hydrometer case, and some tape. Okay, it was mostly tape, but it got the job done. I like to use vodka in my airlocks instead of water because it seems to keep the bad things out a little more readily. It didn’t bubble as nicely as a manufactured airlock, but bubbles came out and nothing was going in, and that’s the point! I also high-tailed it upstairs and ordered an airlock on Amazon which I received the following day. I religiously stirred the hell out of it for a couple of days, then mostly forgot, but managed to stir it at least once a day. I measured the gravity after a week and found it was up to about 4% already. I continued to stir it once a day or so, or at least a few times a week. It was bubbling at a rate of about 4 bubbles per minute (about 15 seconds apart). I didn’t rack it as planned; I just topped it off with 1 qt of syrup and 2 qts water to bring it up to 5 gallons. Final ABV after topping off was 6.8%. Bubbling had slowed to about 3 bubbles per minute (about 21 seconds apart). I finally racked it, straight into the carboy. Bubbling had slowed to less than 2 bubbles per minute (around 32 seconds apart). The gravity was still strong after racking. I planned to add more syrup and top it off, but the jolt kicked the fermentation back into action, so I decided to give it a few days to see how it looked. The only new unexpected twist was that the cap I had ordered for the carboy (along with my emergency airlock order on day 1) wouldn’t stay put. It was a sort of weird waxy plastic that kept popping out. I solved that with about half a roll of electrical tape. I guess I’ll deal with that the next time I try to rack or take readings. By morning, it was bubbling at a rate of more than 10 bubbles per minute (5-6 second apart). Measuring the rate of the bubbling isn’t terribly scientific, but it definitely helps to see when fermentation is slowing or picking up again, so I like to write it down. It’s a little harder to measure volume now, because the carboy doesn’t have any handy markings on it, but that’s probably pretty close. There’s a line in the glass of the carboy that I’ve decided must be the 5-gallon mark, so I’m going to use that to estimate the volume from now on. It shouldn’t be off by more than a few cups altogether. 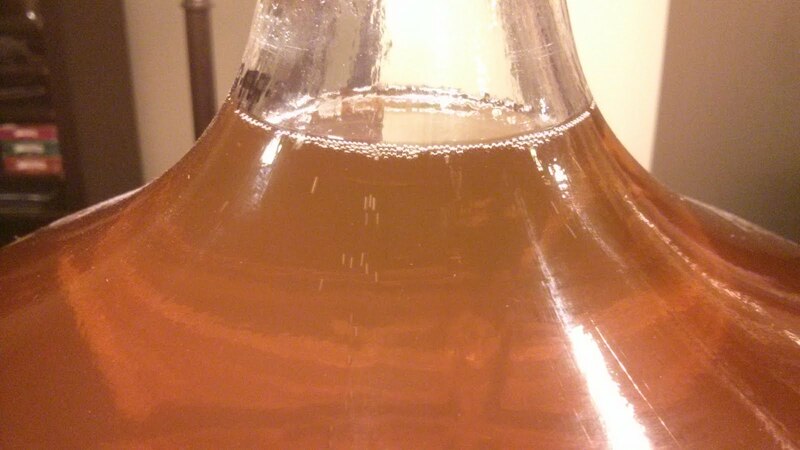 The bubbling after racking had slowed to about 6 bubbles per minutes or a bubble ever 10-11 seconds. Racked the mead and returned to the carboy with enough of the leftover syrup/water mixture to bring it up to 5.5 gallons (the top mark of the carboy). (I also took the opportunity to put gallon measurements on the outside of the carboy to make the measuring process easier in the future.) There has been a fair amount of bubbling over the past several days (remaining consistent at about 5-6 bubbles per minute, but that’s not really reflected in the gravity readings. The gravity has only gone down by 2 (about .25%) over the past week. So there was also little change when I topped off the carboy, giving a current ABV of 9.325%. We’re now on to the “rack once a month” phase, though I may update more frequently if anything of significance comes up. 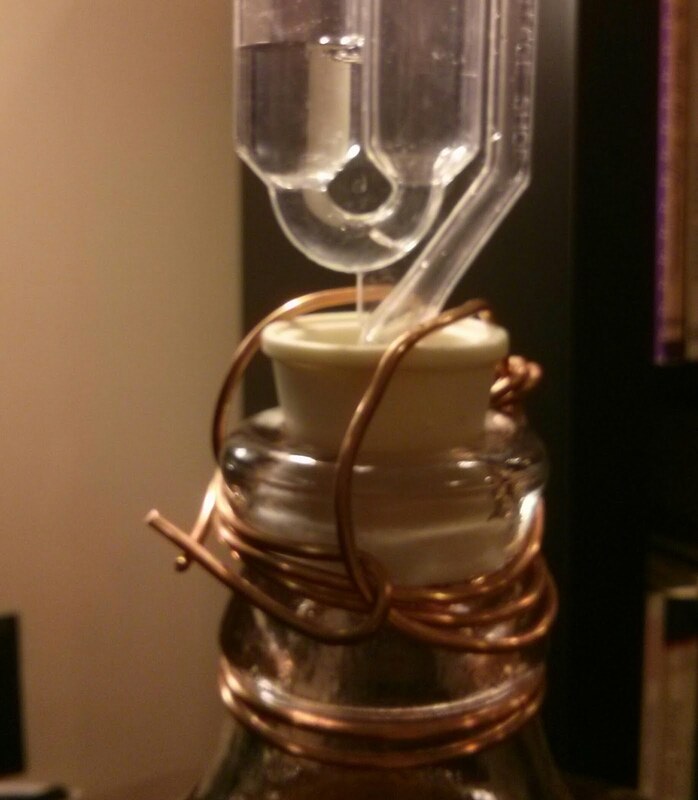 Oh, and I also finally did something about that airlock situation... Crude, but effective, and even kinda pretty. 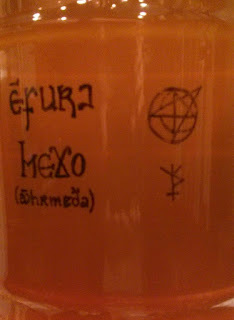 Racked the mead, which is now getting very clear. No change in ABV, and not enough of a difference in topping off to measure. Fast-forward a couple of weeks, yeast has pretty much stopped collecting at the bottom and the mead is fairly clear. Bubbling has decreased to less than one bubble every 5 minutes. I don’t anticipate a lot of change between now and bottling time, which I still estimate to be somewhere around the beginning of February, except that the bubbling should have slowed by then to about once per hour. 2016.01.21 – Moon gibbous in Cancer. 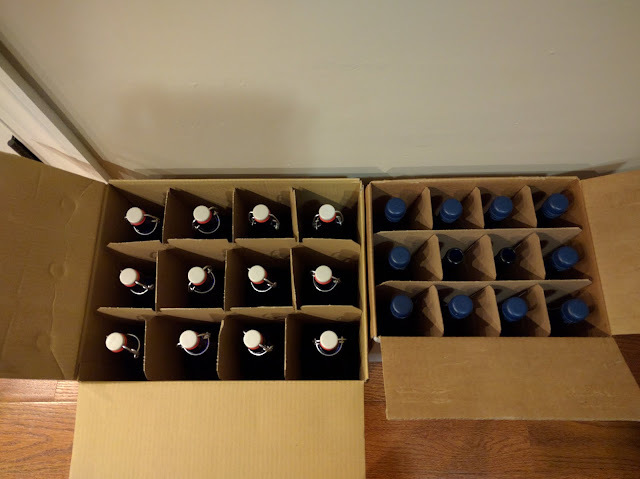 FG: 1025 (10.5%), no δ – Bottling time! In all, I filled twelve 32oz. bottles and 10 750mL bottles… which should be just about exactly 5 gallons. I kept them in the boxes the bottles came in and stuck them in the cellar. In six months, we’ll see how it turned out – I’ll post an update then!